Jamie Barton is a fine singer. There’s no doubt about it. She won both the Main and Song Prizes at the 2013 BBC Cardiff Singer of the World Competition, garnered the Richard Tucker Award in 2015 and this year was awarded the Metropolitan Opera’s Beverly Sills Artist Award. You can pretty much believe the rave reviews. Currently singing Adalgisa in Norma at the Metropolitan Opera, Barton has loads of fans in New York City, who came out to hear her in this splendid, challenging recital in Zankel Hall. Just as delightful was the number of people under 40 in the audience. More power to her. There was no guessing as to what she and pianist Kathleen Kelly set about to do, as Barton explained it to the audience. 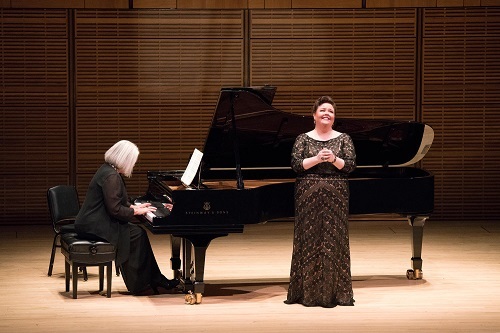 They comprised a program that reflected who they are as musicians, featuring contemporary and new works, songs by women composers of the past and ones that challenged gender stereotypes as to who can sing what. As for the latter, it might be said that women have more ease crossing the gender line than do men. Little notice is taken when a contralto tackles Schubert’s Winterreise, but a bass singing Schumann’s Frauenliebe und -leben or Wagner’s Wesendonck Lieder still gets music journalists’ pulses and fingers (generally male ones) racing. With her innate grace and authority, Barton hearkens back to an earlier age of song recitalists, adopting the classic poses that are often parodied but with her are authentic and natural. The voice is a velvety mezzo of considerable size, lush and lustrous from top to bottom. Her diction and flare for language are superb across the board, but when she sings in her native tongue it is something special. Barton is one of those singers who makes the English language sound beautiful, and oh so expressive, whether giving voice to the words of Robert Browning, E. E. Cummings or contemporary American writers such as Rita Dove, Kathryn Daniels and Liz Lochead. Barton opened with a glowing rendition of ‘Heather’ by the American neo-romantic composer Elinor Remick Warren, who maintained that there is ‘no gender in music’. Amy Beach, who not so long ago was known as Mrs. H. H. A. Beach, was a proper nineteenth-century Boston matron whose older husband frowned upon her appearing in public as a pianist; teaching piano was also out of the question as she hardly needed pin money. After his death she concertized in Europe and became one of the most acclaimed American composers of her day. Barton turned Beach’s ‘Ah, love but a day’ from Three Browning Songs into a poignant lament over the fleeting vagaries of romance. Nadia Boulanger is remembered for having taught many of the leading composers and musicians of the twentieth century, but early on she abandoned composition, declaring to her teacher Gabriel Fauré, ‘If there is one thing of which I am certain, it is my music is worthless’. ‘S’il arrive jamais’ is one example of her exquisite style, a love song that Barton sang with an exalted immediacy. Her younger sister Lili was the first woman to win the Prix de Rome for composition, cared for wounded soldiers during the First World War, died at the age of 24 and posthumously had an asteroid named after her. Barton displayed the rich lower regions of her voice in ‘Attente’, with a text by Maurice Maeterlinck, which tells of the ecstasies as well as the perils of an affair of the heart. American composer Libby Larsen has written, ‘[O]ur own American language has beautiful rhythms in it; it is this American vernacular and the rhythm of our American life that is the language of my music’. In the song cycle Love after 1950, which Larsen calls ‘the new woman’s Frau, Love ’em and Leave ’em’, those sounds and rhythms include the blues, honky-tonk and a slow tango. Barton evoked wry, knowing smiles as well as laughter in ‘Big Sister Says, 1967’, as she told of the effort a woman goes through to make herself beautiful, including plucking, razor blades, sleeping in rollers and devices that would be at home in a medieval torture chamber. ‘Love hurts’ was the constant refrain. Iain Bell’s romance with the human voice has caught the attention of more than one fine singer and captivated audiences on both sides of the Atlantic. of you, commissioned by Carnegie Hall, is a cycle of six songs on poems by Cummings that muse on the intimate aspects of love. Bell’s accompaniments are often spare, such as the crystalline sounds of rain falling or a sensuous ostinato when he seeks to get inside a lover’s mind. The vocal lines are mostly declamatory, with brief melodies appearing in the most sensuous passages, perfect for Barton’s singular approach to text. No composer could wish for either a more committed performance than his new cycle received from these two artists, or the reception this beautiful work received at its premiere performance. The most extended work on the program was Haydn’s Arianna a Naxos, in which Barton gave voice to the many moods of the mythical princess. Arianna’s love for Theseus was expressed with nobility and passion, while her outrage over his betrayal seethed with injustice and cries for vengeance. The recital ended with three songs from the core of the song repertoire. Ravel’s Don Quichotte à Dulcinée is traditionally performed by a low male voice. As sung by Barton, the third song of the cycle, ‘Chanson à boire’, took on the light-hearted sparkle of champagne. Duparc’s ‘Phidylé’ was bathed in a luxuriant sensuality, and she concluded with a glowing account of Strauss’ transcendent, ecstatic paean to love, ‘Cäcilie’. Born and raised in northwest Georgia, Barton has Southern charm and manners, traits that are often parodied but that when genuine warm the heart. She graciously took note of all the familiar faces in the hall, as well as welcoming the new ones to her recital. She told us that in her home there was little classical music, but there was television and she was captivated by Mary Martin as Peter Pan. The very first song that she ever sang in public was from that musical, and another, ‘Never Never Land’, was her encore on this night. To a standing ovation Barton returned to the stage once more to offer ‘Acerba voluttà…O vagabonda stella’ from Adriana Lecouvreur. Both singer and pianist clearly know the places where dreams are born and indeed may just come true.